1.The ability to analyze, interpret, and understand the complex interrelationships between authors, texts, and specific social, political, and historical contexts. Students will demonstrate the ability to think critically about the ways in which various aspects of identity, subject positions, and affiliations—including but not limited to race, gender, class, and sexuality—inform the development of national, transnational, and international literary traditions. 2. A demonstrable ability to use the terms, categories, and concepts of critical or “close” reading. A student in the English Major should gain the ability to read, understand, analyze, interpret, and extrapolate from the complex texts that are at the heart of the diverse traditions of the English language. This includes texts that are oral, printed, and visual, from older traditions and new media alike. They should be able to interpret works by using the disciplinary vocabulary for studying English (including such concepts and terms relating to genre, style, tropes, conceits, forms, narratives, technologies, and theories—of literature, film, creative writing, and culture). 3. A working knowledge of literary canons in English, as well as strategies for critiquing them. We read books and we read cultures, and there are many communities of English with great traditions of expressive works. So while it is impossible to expect students to master all of our language’s creative traditions, it is essential that students be exposed to a historical range of works that form part of the British, American, and African American canons. It is essential that students learn not only about some of the works that have historically belonged within a given canon, but that they learn how to critique the decisions, deletions, and negotiations of power that go into forming any cultural canon. 4. Experience conducting research and, for students of creative writing, the production of new artistic work. It is a special disciplinary benefit of the English major that it provides students with a field for exercising skills of disciplined and independent inquiry that transfer to all walks of life. Research and writing, in different forms and resources—archives, libraries, collections, criticisms, histories, databases, and more—are therefore also at the core of the English major. Similarly, students who pursue the Creative Writing Option produce independent verbal and artistic works and assemble them into a senior portfolio. 5. 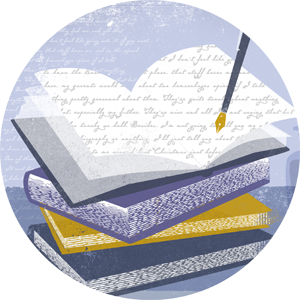 The ability to write well—critically, creatively, or both. Languages are alive, standards of correctness change, and different groups communicate in different ways. The English major provides students with a uniquely practical and creative grasp of the English language. We train them to write well, and expressively, with an ear for different voices. The English Major teaches students the competencies necessary for composing prose that is effective for its audience and context; mature in its voice and cogency; and correct for its purpose and person. In written and oral assignments, students cogently convey their own interpretations and perspectives, or produce new creative and artistic works themselves.